Reading With Scissors: Hollow, My Baby! Hollow, My Honey! 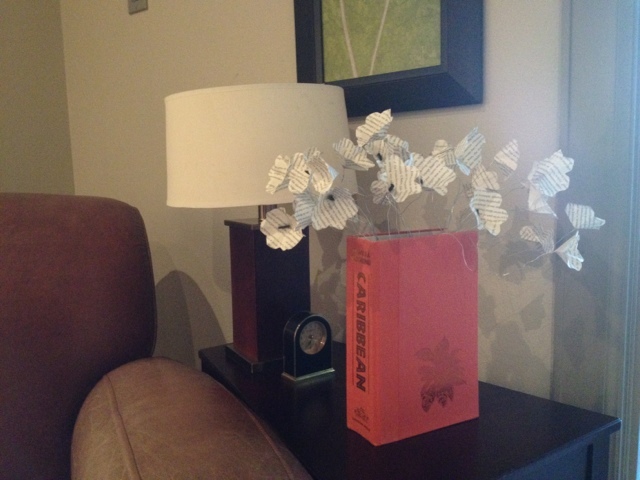 Flowers were some of the first things I made from book pages. In fact, my first bouquet still sits in my office. One of the nice surprises from my day at Eggstravaganza was how quickly people snapped up the flowers I folded for when my baby got married. They were gone before noon. These flowers are called kusudama flowers and there are tutorials all over the web for how to make them, like here and here. Recently I saw some hollow kusudama flowers on this blog. I did a little digging around on the Googles and found that you make them with square frames instead of solid squares, so I tried my hand. Here's my first attempt. Compare the back of one of these hollow flowers with the back of a regular flower. So many possibilities with that flat back! Much easier to glue onto things. And then I started to think about one of my other ongoing dilemmas--how to add color to my flowers. Most of the time I add a pretty bead to the center of the flowers, and I can still do that with the hollow version, but that's a really subtle color add. So I thought to myself...what if I combine a hollow flower and a regular flower and combine book pages with scrapbook paper? And voila! Color and words! And I can do them the other way, too! I really like these and I can't wait to make more. The hard thing about creating hollow versions,however, or these combined versions, too, is creating a paper frame. Cutting out a square is pretty easy, but a square within a square? Not so much. But my fancy-dancy new Silhouette Cameo comes to the rescue. I can make squares within squares within squares and cut them out of book pages or scrapbook pages. Whoo-hoo! Now I can't decide what to do next--fold more words or fold more flowers. What a wonderful problem to have! I've been trying to figure out a solution to the pointy-ends of those kusudama flowers for forever - thank you for teachin' me!! !